Why to buy a Jacuzzi® product? The elegant and spacious Jacuzzi J-365 offers a relaxing experience for your entire body. This model represents the quality and guarantee of the Jacuzzi® brand both for its advanced features and its modern design. The J-365 model has seven seats. The innovative and improved J-300 collection with its model J-365 stands out for the newest technical innovation in the market of spas giving you the ultimate hydro-massage experience. The Jacuzzi J-365 features, adjustable lighting system, backlit cup holders, two adjustable valves to customized the power of the massage, illuminated and adjustable neck pillow and a waterfall. Watch the video and immerse yourself in a full Jacuzzi experience! Regardless of which model you choose, the J-300 Collection does more than enhance your wellbeing; it makes a statement. 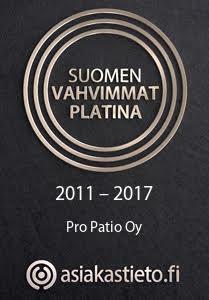 Pro Patio Oy is an AAA-rated company specialized in outdoor and indoor pools, swimming pools and hot tubs. Get high quality pools from all sizes and price ranges, from leading manufacturers worldwide. Pool supplies and maintenance are also included in our service offering. In our store, there are nearly 30 whirlpools, hot tubs and swimming pools. From our extensive range of pools, we will surely also find pools suitable for your needs. Power of water! Security check: please, tick the box below to let us know you are human. We guarantee 100% privacy. No information is given to third party. Why to buy a Jacuzzi® hot tub? The company has been awarded with numerous certificates that confirm our dedication to quality and reliability.